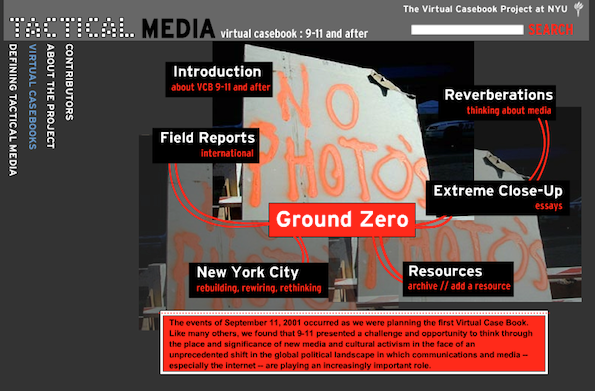 9-11 and After: A Virtual Case Book was a prototype for a planned series of “virtual case books” (VCB), each organized around a key area of cultural activism in which tactical media played a central role. Because tactical media practices (see definitions) are inherently responsive, interactive, and constantly evolving, we chose a format that would make it possible to capture the specificity of such developments in different political and cultural contexts. We also took advantage of the interactivity offered by web-based forms of publication, enabling us to invite others to join an ongoing conversation, and allowed readers to simultaneously access, analyze, and respond to the ideas, images, resources, and the multitude of links contained in the VCB. Plans for this series were hatched at a workshop held in April 2001 entitled Tactical Media: The Impact of New Media on Cultural Activism and Political Engagement, organized by The Center for Media, Culture and History and funded by The Rockefeller Foundation through its Creativity and Culture Program, which also provided funding for the casebook. A follow up event was heald in December, 2002: Tactical Media Lab at NYU: Pedagogy, Activism, and Research: Tactical Media in the Space of the University.